What the hell, it must be famous vintage movie/TV car auction week or something. I mean, all of these rides have an edge on my tricked out '97 Honda Accord (happy 10 years! ), but they also all cost just a slight bit more. Let's run down the list. The auction for the original Batmobile from the 1960s TV show starring Adam West was the first to catch my eye. Nothing says BANG! POW! WHAM! like this slick ride. It's expected to go for over $150,000 when the auction hits on February 27th. If the Dynamic Duo's wheels aren't quite the style you're looking for, perhaps you might be interested in a car that talks back. 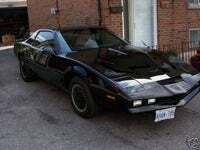 $25,000 and change will net you a handmade replica of KITT from Knight Rider , built from a 1984 Pontiac TransAm. The auction ends on the 31st, so get your bid in now. No word on whether or not it includes smokescreen and oil slicks. Finally, for those who ain't afraid of no ghosts (wait, isn't that a double negative? 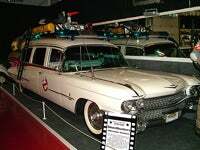 ), the 1959 Cadillac that served double duty as ECTO-1 in Ghostbusters is also up for the sale. It'll run you just $150,000, and they throw in this bit of bonus trivia: before being used by Bill Murray and Dan Aykroyd, the car was previously used by Sidney Poitier and Rod Steiger in In the Heat of the Night . Total cost of all your classic car dreams: $325,000. Of course, you'll also be needing at least a three car garage.